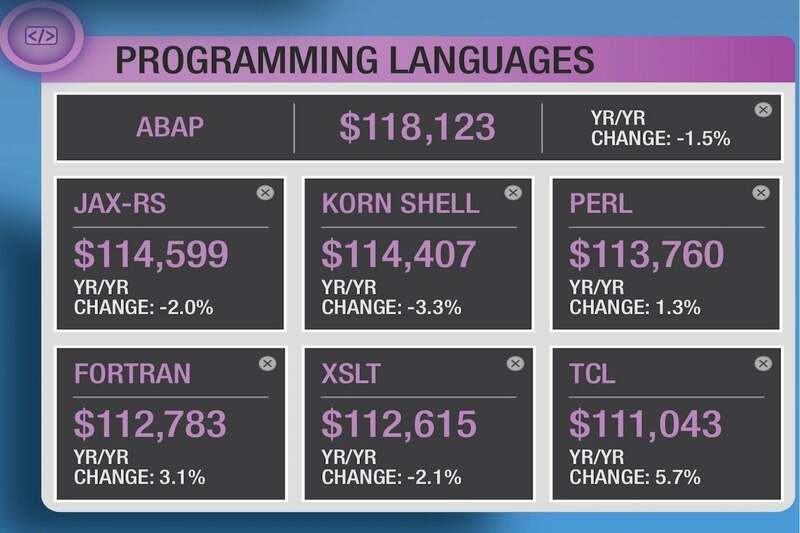 Which programming language pays best? 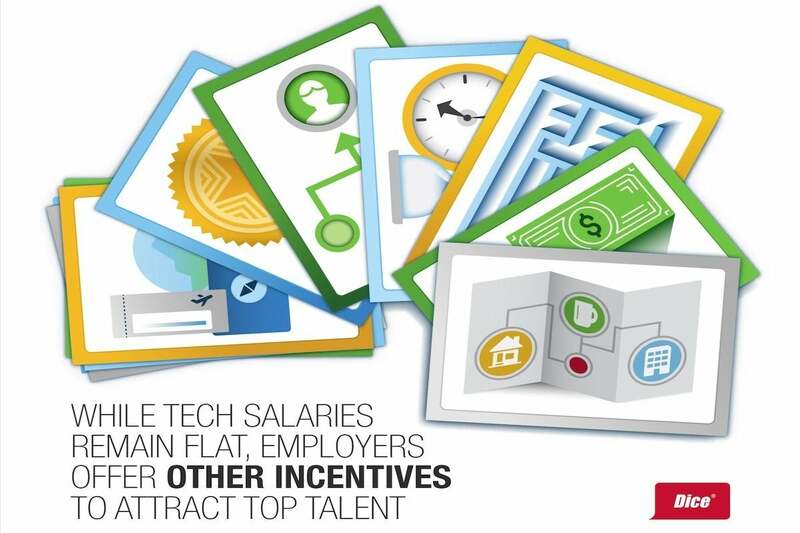 If you’re looking for your next -- or even first -- job in IT salary is probably one of your top concerns. 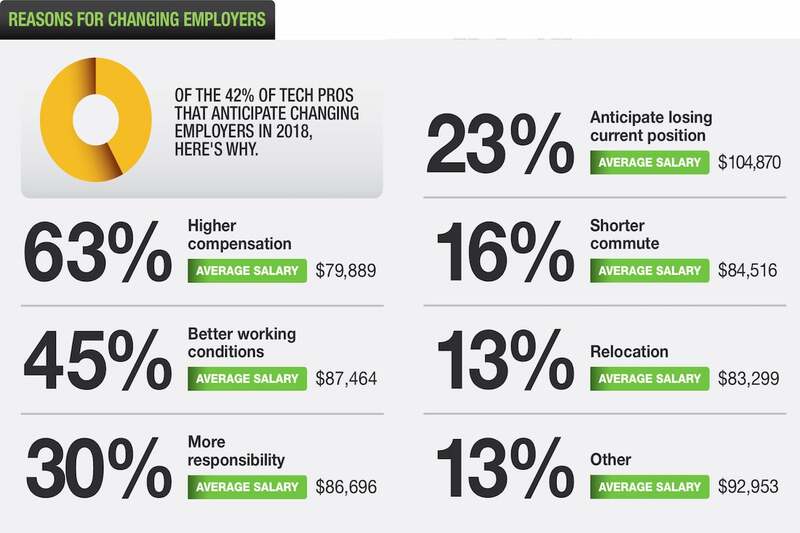 In its 2018 Tech Salary Report, Dice has sliced the information technology salary data every which way: We’ve picked the highlights for you in this slideshow, in which you’ll find the places, skills and industries that pay the best. 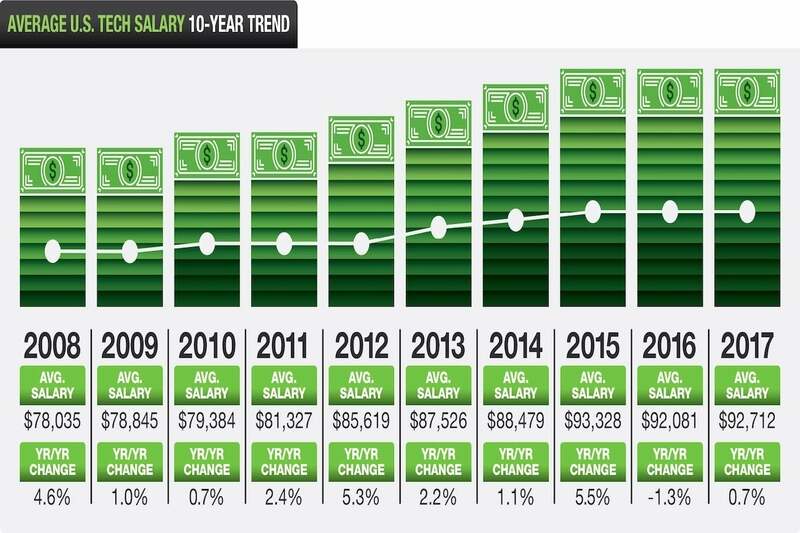 It’s no surprise that IT salaries stagnated for a year or two during the 2008 recession, then were slow to rise. But after steep increases from 2012 through 2015, they’ve plateaued again, averaging US$92,712 in 2017 -- up just 0.7 percent on 2016. If you didn’t get a raise last year, you’re not alone. 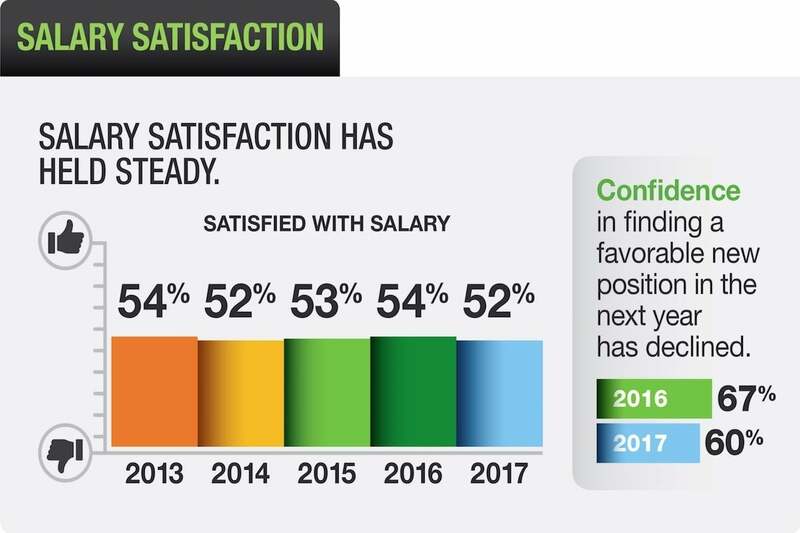 Despite the stagnation in average IT salary, satisfaction is stable, Dice found: At 52 percent, it’s the same as it was in 2014 when salaries were still rising. At the same time, that satisfaction may be somewhat forced: IT workers are less confident of finding of finding a favorable new position than they were a year earlier. If you want a raise, it’s clear you’ll have to work for it. 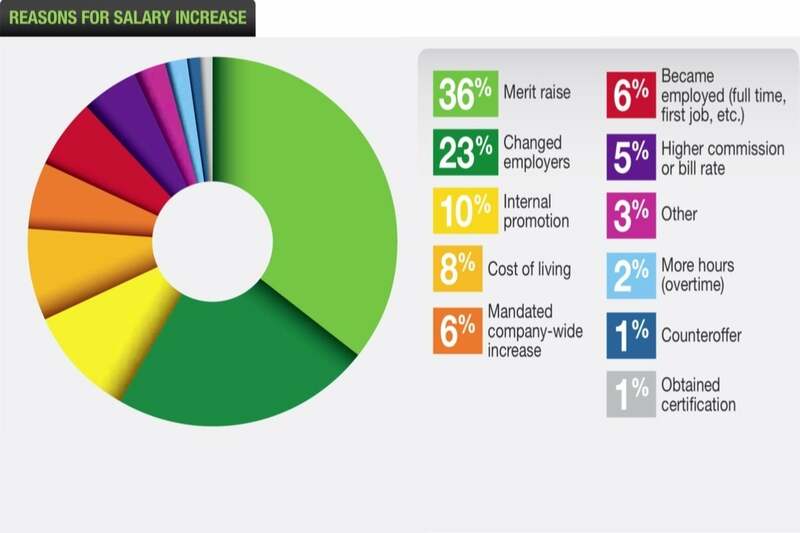 For those IT workers that did get a salary raise, the most common reason was merit. Almost a quarter had to find a new employer to get their raise, while for one in 10 their raise accompanied a promotion. Sadly, getting certified in new skills is not a sure way to more pay: Just 1 percent of pay rises came about as a result of obtaining certification. So is a raise the only reason to change employers? Well, no, but it is the main one, especially for those on lower salaries, IT workers told Dice. Interestingly, fear of losing their current position was most common among those with higher salaries. Other reasons included gaining responsibility, shortening the commute, or relocating. 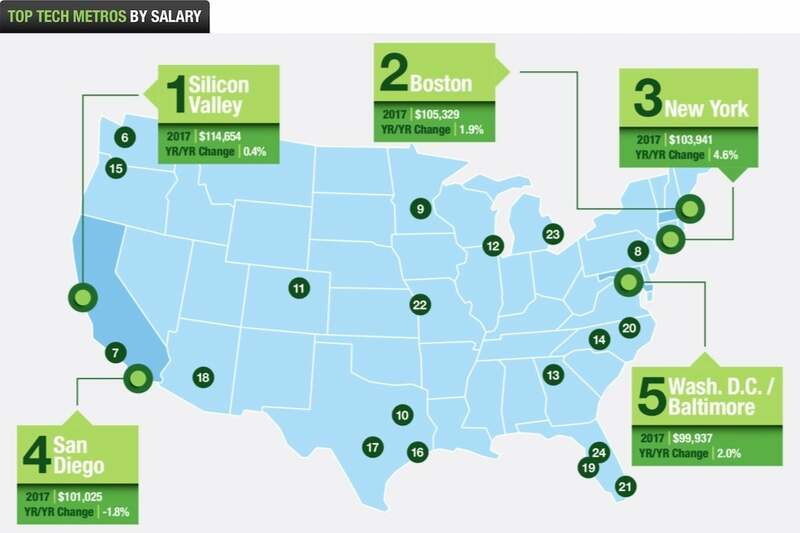 Silicon Valley is still the best-paid places to work, with an average IT salary of $114,654, although salaries there rose more slowly than in other top metro areas. Boston ranked next, followed by New York, the metro area with some of the fastest-rising IT salaries. Other climbers not on the map include Philadelphia, up 7.7 percent with an average salary of $97,415; Atlanta, up 5 percent at $92,637, and Portland, up 6.5 percent at $91,192. Seattle salaries stagnated at an average of $99,352. One of the biggest drops was in Austin, down 4 percent to $90,214. While some workers move in search of a rise, others would be willing to take a pay cut in order to stay at home. 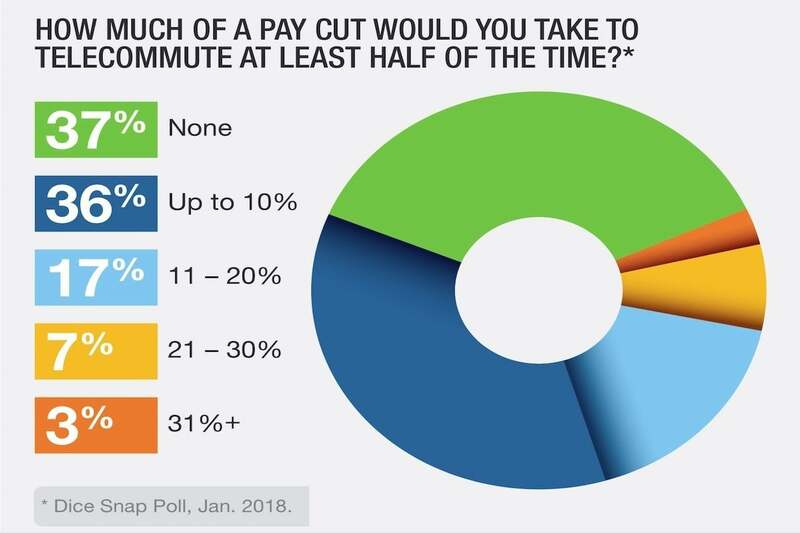 Dice asked how much of a pay cut IT workers would be prepared to take in order to telecommute at least half the time. 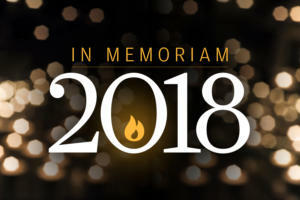 A third said they would take a cut of more than 10 percent, with one in 30 valuing the home life so much that they would take a cut of over 30 percent. We hear a lot -- too much -- about how millennials aren’t saving because they’re squandering their salaries on fancy lattes and avocado toast, but the fact is that they’re just not paid as much as previous generations. 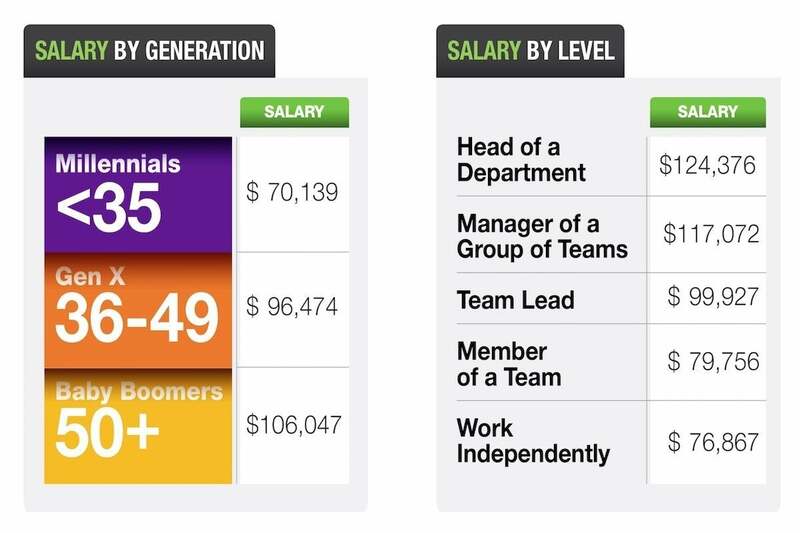 Barring a few outliers like Marc Zuckerberg, the best cure for this will be to gather up those merit raises -- and to seek promotion: Whatever generation they’re from, your boss’s boss could be earning almost 50 percent more than you. Here we are at last: What you need to learn if you want to make the big bucks. Dice identified platform-as-a-service as the top-paying IT skill, with salaries reaching the heady heights of $127,171 a year. Close behind came big data skills in MapReduce and Elasticsearch, a search engine based on Lucene. 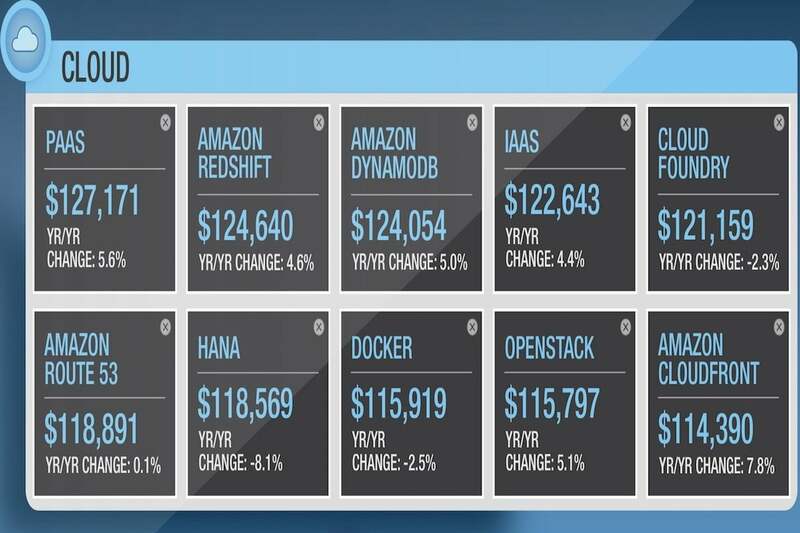 It’s worth brushing up on your Amazon Web Services cloud skills too, with Redshift and DynamoDB also making the top 10. 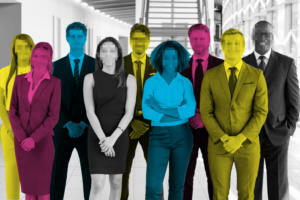 If you love standards and documentation, then you might want to check out Capability Maturity Model Integration, a process that the CMMI Institute says will transform your organizational performance by improving capabilities that will drive meaningful business results, or ISO/IEC 27000, the international standard for information security management systems. Let’s take a closer look at those top-paying cloud skills. 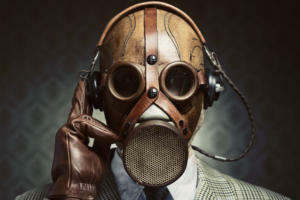 If you don’t know about PaaS, you can always boost your knowledge of IaaS. Redshift and DynamoDB aren’t the only AWS-related skills employers are interested in: Route 53 and Cloudfront also pay well. And beyond that, there’s high demand for those with knowledge of Cloud Foundry, SAP HANA, Docker and OpenStack. 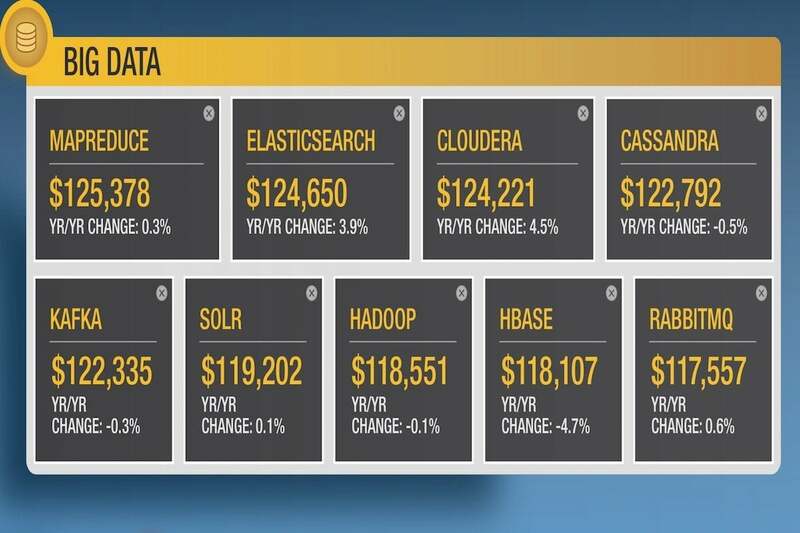 We already saw that MapReduce, Elasticsearch and Cloudera are highly valued, but if you want to make the big bucks in big data, what else should you learn about? 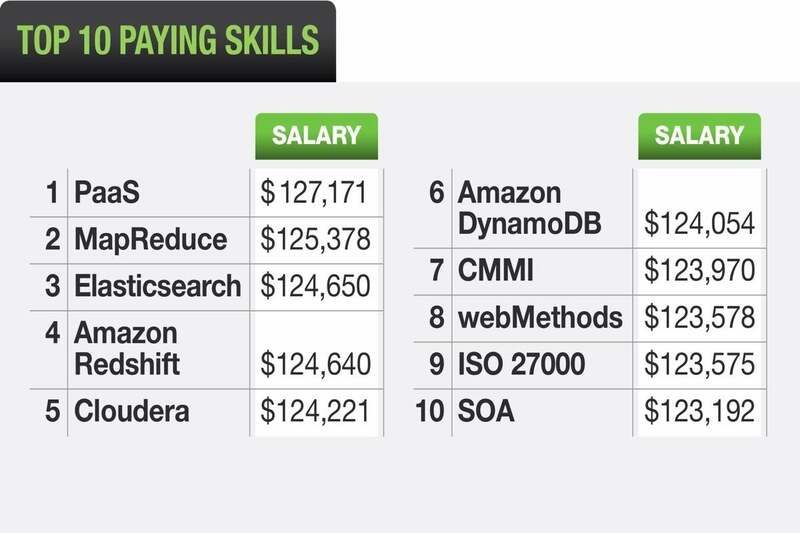 Dice ranks Cassandra, Kafka, Solr, Hadoop, Hbase and RabbitMQ as among the best paying skills in big data. For some employers, it ain’t what you do it’s the way that you do it that gets results. 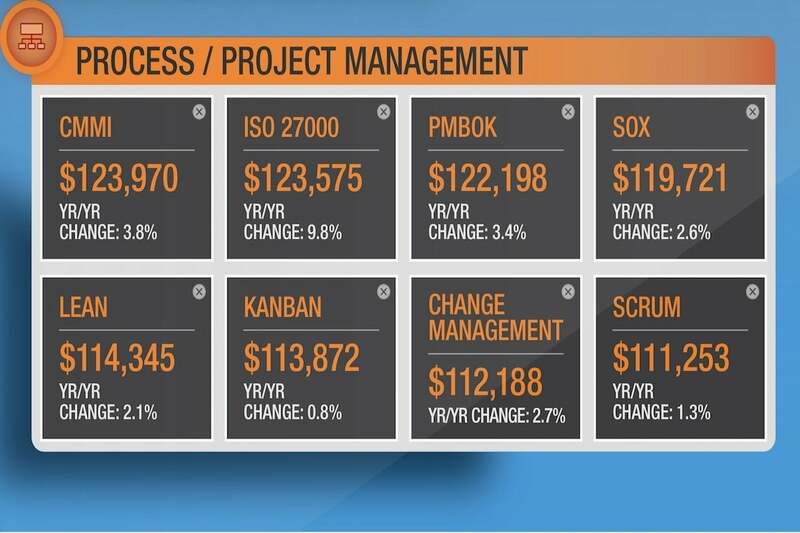 Capability Maturity Model Integration and ISO/IEC 27000 figured in Dice’s top 10 paying skills, but there’s also demand for IT workers familiar with PMBOK (Project Management Body of Knowledge) terminology or the details of SOX (that’s the Sarbanes-Oxley Act, not the esoteric Schema for Object-Oriented XML). When it comes to management philosophies, there’s little to choose between Lean, Kanban and Scrum -- at least from a salary point of view. If you’re into Java, then you should definitely be learning about the Java API for RESTful Web Services (JAX-RS), which Dice identified as the top-paying programming skill. Close behind comes knowledge of the Korn shell, Perl, Fortran, XSLT (eXstensible Stylesheet Language Transformations) and TCL. When it comes to salary maximization, having the right skills is one thing: Putting them to work in the right place is another. 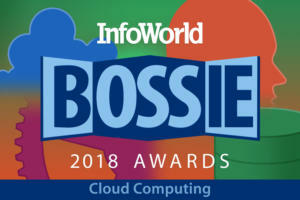 Dice identified banking, financial services and insurance as the best-paying industry for IT workers, with an average salary of $108,527. 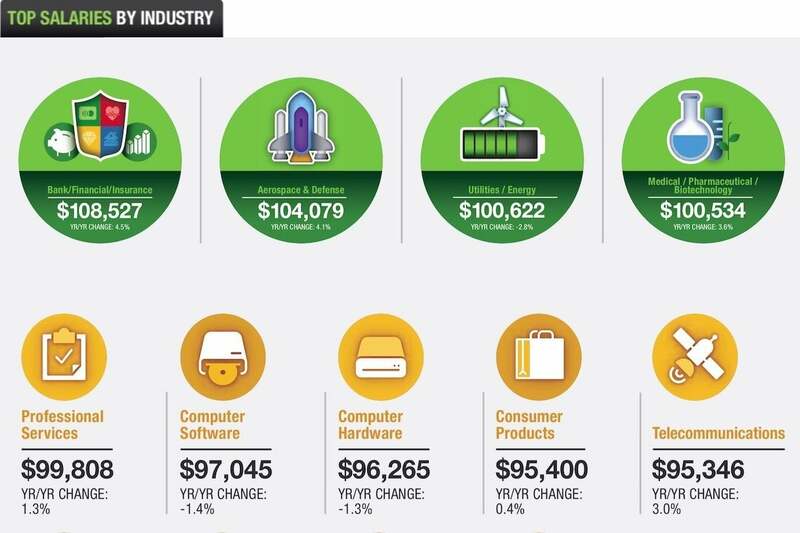 Aerospace and defense ($104,079) came a close second, with salaries in these top two industries growing at over 4 percent in 2017. 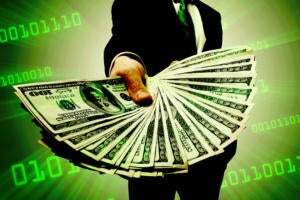 IT salaries in the medical, pharmaceutical and biotechnology industries are rising fast too, up 3.6 percent to an average of $100,534, and seem set to soon overtake those in the utilities and energy sector (down 2.8 percent to $100,622). Other sectors paying their IT workers well include professional services ($99,908), computer software ($97,045), computer hardware ($96,265), consumer products ($95,400) and telecommunications ($95,346). Not shown on the slide are the places IT workers earn the least: at non-profits and in education. Presumably other things motivate those who work in places like that. Whatever motivates workers, there’s been a steady increase in the number of employers offering inducements to retain the skilled ones. Dice found a variety of carrots on offer beyond the pay rise, including flexible working conditions, more interesting work, training, promotion and -- for the happy few -- more vacation or paid time off. If you want to delve deeper, you can download the full report from the Dice website.